Kindly agree with our terms & conditions. How Does it Work for Buyer? 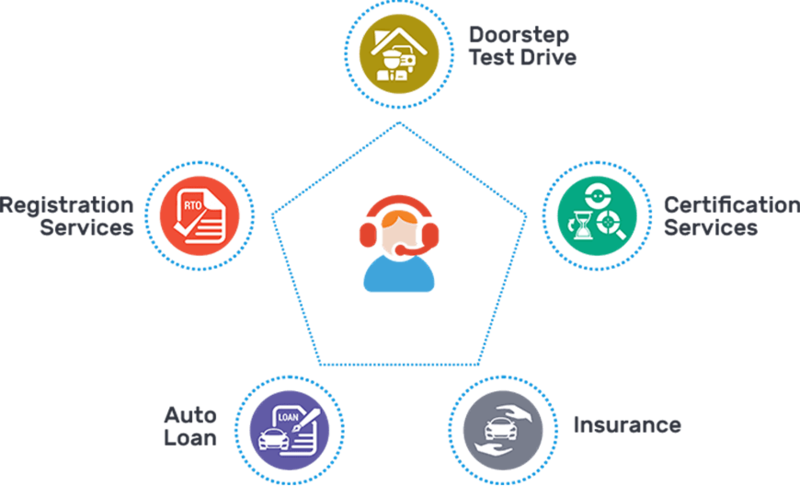 Droom stands behind each and every buyer with world-class buyer protection program. 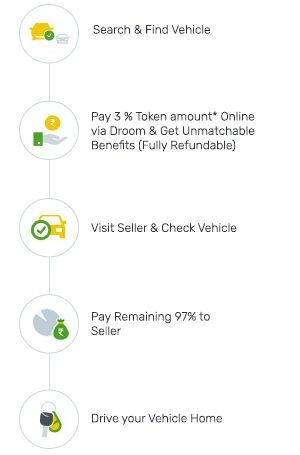 Droom Buyer Protection covers Token Amount (2% - 3% as per category) or the full purchase amount paid if paid to seller via Droom and the buyer can get full refund of the money paid for Committed Buyer or full transaction amount to a seller via Droom. Significantly different from listing description e.g. condition, seller declaration etc. I was looking for a motorcycle and droom helped me to find the most suitable bike within my budget. droom team helped me at every step to close the deal and making it one of the best Automobile Experience of my life. Droom has very trustful and real listings. When I inspected the bike it was exactly same as described on the Droom and the price was the most competitive. I found the Droom app very user friendly and helpful. I was able to close the deal for Bajaj Discover 2012 model within a day. I would recommend people who are looking to buy used vehicle to have a look at Droom for a hassle free experience. What is Token Amount? Why should I pay it? Token Amount is the 2- 3% (depending upon the category) of the final selling price that is paid as advance money by the buyer on Droom’s online platform. Rest 97 - 98% of the final selling price is paid directly to the seller (100% final selling price = 2% token amount + 98% final value payment). It is fully refundable, no questions asked, under Buyer Protection. Once buyer pays the token amount the listing gets deactivated and buyer can meet the seller to test drive and inspect the vehicle before closing the transaction. In case of order cancellation token amount is processed within 5 business days. What are the different pricing formats available ? Droom provides three kinds of pricing formats, “Fixed Price”, “Best Offer”, and “Auctions”. “Fixed Price” allows you to buy at a fixed price while “Best Offer” allows room for negotiation. “Auctions” allows buyers to bid on vehicles, which are subsequently sold to the highest bidder. Droom provides three kinds of pricing formats, “Fixed Price”, “Best Offer”, and “Auction”. Fixed Price is the traditional way to sell something with a fixed price tag. The seller decides a listing price for his listed item and then you will have to make the deal at the fixed price only. What is a Best Offer? Droom provides three kinds of pricing formats, “Fixed Price”, “Best Offer”, and “Auction”. Best Offer is an innovative way to check market sentiments. This gives you as a buyer, an option to make an offer for a listed item. A particular buyer can make up to 5 offers against one listing. How many times can I make an offer under Best Offer? Best Offer is an innovative concept to sell and buy. Under Best Offer, you can make up to 5 offers for a particular item. The Seller has the right to accept or reject any offer made by a buyer without any further clarification. What is the minimum start price for a Best Offer? There is no minimum restriction on the start price to place a best offer. It completely depends on buyer’s understanding of the product and market. A buyer can make up to 5 best offers against a particular listing, beyond which he or she will not be eligible to make any offer against that item. Droom provides three kinds of pricing formats “Fixed Price”, “Best Offer”, and “Auction”. Auction allows buyers to bid on listed vehicles, wherein the vehicle is sold to the highest bidder. This allows buyers to score unique deals at unique prices. A registered buyer can make unlimited number of bids. As of now, the “auction” option is only available on the droom.in website. At Droom, when a buyer makes the payment of token amount for a product, the entire fees is covered under our Buyer Protection program. Droom’s Buyer Protection allows buyers to be eligible for full refund of the token amount, no questions asked. Can I contact seller using Droom’s app? Yes, you can contact the seller using Droom’s app once you commit to buy a particular item. Droom believes in transparency and trust and hence we hide seller’s personal details from the listings but as soon as you pay token amount, all the vital information of the seller will be mailed to you and can be checked in the “My Account” section. How do I search for a vehicle for me? Droom is a technology driven platform and allows user(s) to search for an item via entering “Keyword” as make, model, or the year of the vehicle you are looking for. Users can browse our well-defined and categorized catalogue as per the preference. The Droom app and website also enable users to make further refinement in the results set via a vast selection of filters and sorting. My account is your personalized section on all Droom's Platforms-Website and Mobile Apps(Android and iOS). Via “My Account” you can check your watchlist, update profile, purchased items details, committed items/seller details, and much more. Additionally, you can control alerts and notification settings from the “My Account” section. Watchlist is a powerful tool to help you shortlist items. On every item listed on Droom, you will see a “watchlist” icon on top and you can bookmark this item for future reference or comparison with a simple tap. You can browse your watchlist under “My Account” section. How do I update “My Profile”? To update your profile, go to My Account > My Profile section. Now you can update all your personal preferences and information. What is Transaction Closure Period? Transaction Closure Period is the timeframe within which a seller and buyer needs to meet and close the transaction. If transaction does not complete within this period then it will no longer be covered under Droom Seller and Buyer Protection. Typically, this is between 3-5 days. What happens if I am unable to meet seller within the specified transaction closure period? We recommend buyers meet sellers within the transaction closure period. If you are unable to meet the seller due to the seller's fault then you are completely covered under Droom’s Buyer Protection. In other cases decision is made by our dispute resolution team. Can I make an inter-state transaction? Droom does not put any restrictions in terms of inter-state buying and selling if the buyer and seller have mutually agreed on the deal. However, please note that the buyer and seller need to ensure all the additional paperwork and documentation is in order. What happens if my payment is not ready within the Transaction Closure Period? Ideally, you should be ready to close the transaction within the prescribed Transaction Closure Period with the Final Value Payment (Selling Price minus Token Amount) and documents. However, if you are not ready, you can reach out to the seller and explain your situation. It will be on the sole discretion of the seller whether he is ready to wait or not. What happens if the seller changes his mind after I pay the Token Amount? Your Token Amount is fully covered and refundable under Buyer Protection. If the deal does not close due to seller's fault, then you can raise the issue within the transaction closure period and our dispute resolution team will initiate a refund of token amount. What if I find out later that there was wrong disclosure or material omission by the seller? We encourage you to satisfy yourself with the item after you pay token amount and before you make the final value payment during your meeting with the seller. We try our best to maintain honesty in terms of seller disclosures and declaration, but we are not responsible for any wrong representation, omission, and concealing of information by sellers. What happens to an item that has an auto loan? If the concerned item has any loan. If the NOC is available with the seller in advance. When will the NOC be available if not there.